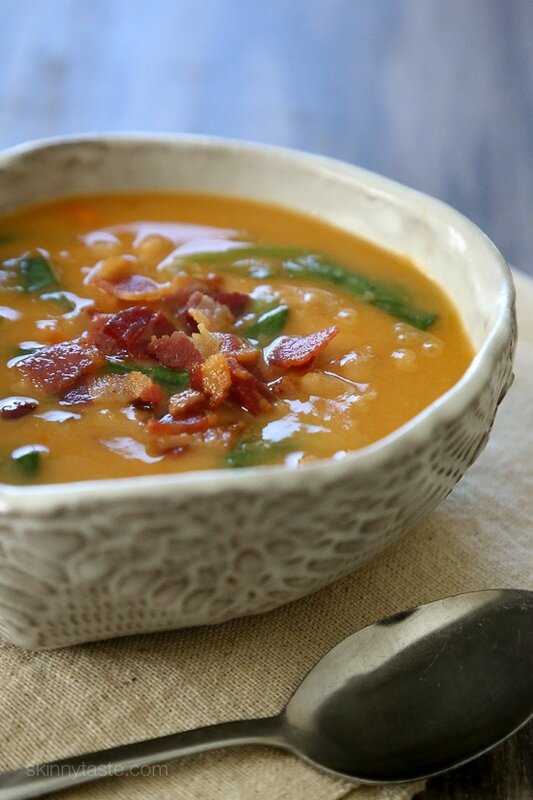 This delicious, hearty Navy Bean, Bacon and Spinach Soup is inexpensive and easy to make, plus leftovers are even better the next day! 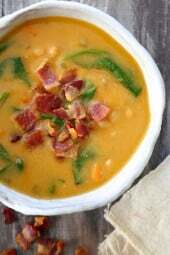 Bacon makes everything better (in my opinion), especially in this Navy Bean Soup. I love soups with beans such as this 16 Bean Soup, and this Pasta Fagiole. 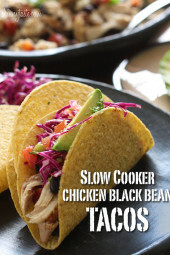 I made this in my Instant Pot (affil link), which is a slow cooker, electric pressure cooker, rice cooker, steamer, yogurt maker in one, but I’ve also included slow cooker and stove top directions as well. There’s a slight chill in the air this week which is putting me in soup mode. It’s also putting me in curl up with a book mode with a cozy throw while dinner is simmering in the kitchen – do you feel me? 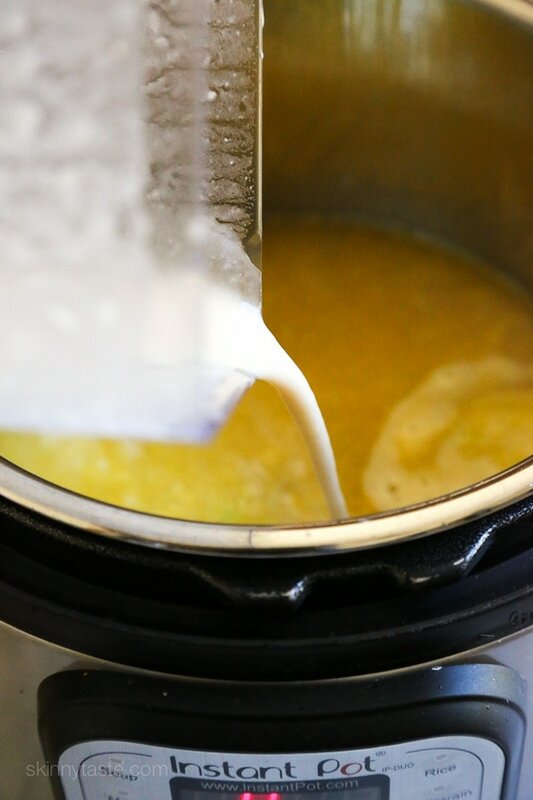 This soup, it’s perfect for this cooler weather and uses pantry staples such as canned beans and broth. If you don’t eat pork, turkey bacon would be great here too. Now that beans are zero Smart Points on the new Weight Watchers Freestyle Plan, I’ve been making beans and legume dishes more often. To thicken the soup I pureed 1 can of beans with water before cooking, then once it was cooked I pureed 2 cups of the cooked soup and mixed it all together leaving the rest a little chunky. I am labeling this kid-friendly because I would have eaten this as a kid, but full disclosure my youngest daughter Madison does not like beans or anything pureed (kids!) but Karina my oldest does. If your kids like beans, they will love this soup. Bacon makes everything better (in my opinion), especially in this hearty white bean soup. It’s delicious, inexpensive, and easy to make and leftovers are even better the next day. I made this in my Instant Pot (doesn’t get quicker than that! ), but I’ve also included slow cooker and stove top directions as well. Press Saute button then cook the bacon until crisp. Set aside on paper towels. 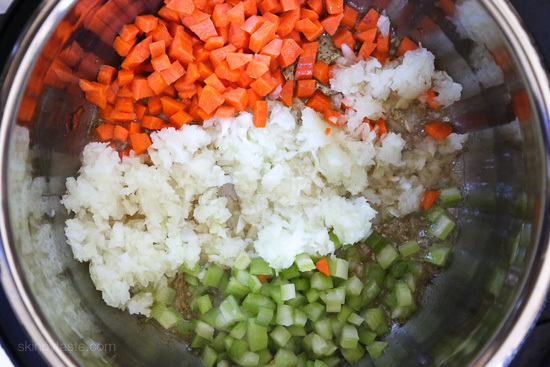 Add the onion, carrots and celery to the pot and cook until soft, about 5 minutes. Stir in the tomato paste then add the pureed beans, beans, broth, rosemary and bay leaves. Cook on high pressure 15 minutes. Let the pressure release, remove rosemary and bay leaves. Place 2 cups of the soup in the blender and puree to thicken, then add back to the soup along with the spinach and stir until wilted. To serve, ladle into 6 bowls and top with bacon. Bring to a boil, cover and cook on low until the beans and vegetables are soft, about 25 minutes. Place 2 cups of the soup in the blender and puree to thicken, then add back to the soup along with the spinach and stir until wilted. To serve, ladle into 6 bowls and top with bacon. Saute the bacon in a skillet until crisp. Set aside on paper towels. Add the onion, carrots and celery to the skillet and cook until soft, about 5 minutes. Transfer to the slow cooker with the tomato paste, pureed beans, canned beans, broth, rosemary and bay leaves. Cover and cook low 8 hours. Remove rosemary and bay leaves. 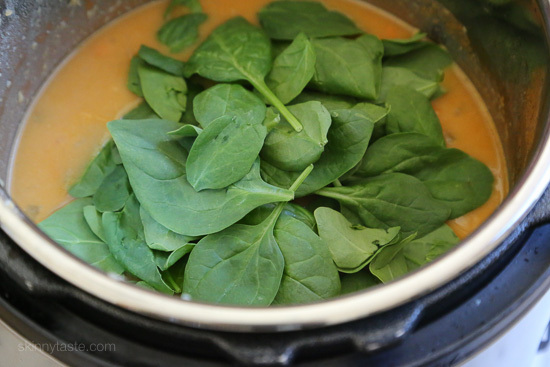 Place 2 cups of the soup in the blender and puree to thicken, then add back to the soup along with the spinach and stir until wilted, adjust salt to taste. To serve, ladle into 6 bowls and top with bacon. Delicious and my husband loved it too!! THIS SOUP IS SO GOOD! I doubled the bacon because…bacon. And I put in double the spinach and carrots for extra veggies. This is going to be a staple in our home. Way to much sodium in most of your meals. Do you have any no salt or Mrs Dash alternatives? I just buy the low sodium beans and broth. This is delicious, and yes better the next day as it thickens up. I did add a Parmesan rind that added to the flavors and it needed salt and pepper for my taste. I made is on the stove top and cooked it for about an hour. this was a great soup! I made it vegan, left out the bacon and used veggie broth. I used dried beans that I had soaked well. followed all directions as stated for the instant pot, and it was a quick, tasty dinner! 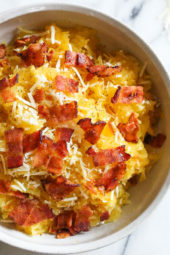 My husband topped it w/ some fake bacon bits, and had two big bowls. My kids didn’t care for it, but they don’t care for beans or soup, so no surprise there. I will certainly make this one again! I made this soup tonight and it was a hit! It’s delicious, filling and comforting especially on a chilly night! 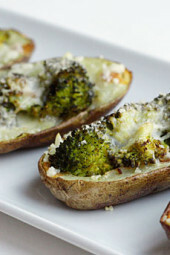 This recipe is now on my “favorites” list! Do you think I could use chickpeas or no?? I have the same question. I have lots of cans of them and no Navy beans. Hi Kellie and Bonnie,I used a mixture of canned beans, had great results. 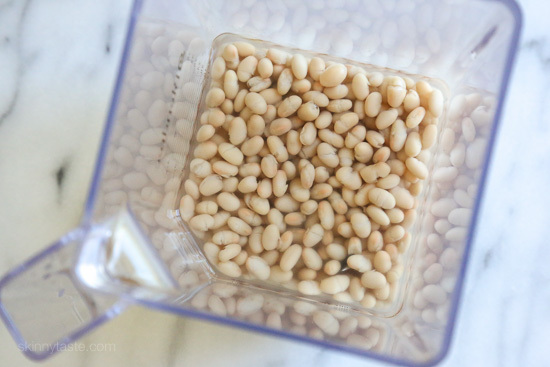 You might just find that chick peas take a bit longer (maybe 35 – 40 minutes) instead of the 25 minutes for the softer beans.Gina, this is a lovely recipe, thank you! Even my meat loving husband loves it, because of the bits of bacon on top. Can the navy beans be replaced with canned white beans? Hey Gina! Where do you find your canned Navy Beans? My local market doesn’t have them. So I bought a bag of beans to soak overnight. Looking forward to this soup! You could use cannelini beans if you can’t find navy. Goya brand has canned “small white beans” that are similar in size to a navy bean – made this soup and it’s delicious! This is very good and super easy to make. It even passed the “hubby test”. Looks like I found another one to add to the dinner rotation. Hi! I love this recipe! Can i make a double batch in the intant pot? If so, do i need to change anything? I think i have an 8quart pot. Was going to do it tonight, if you get this message. Im new to instant pot and havent doubled a recipe before. Thanks! Sure as long as it fits, same time.